COMPANY PROFILE Axis Bank Ltd operates as a private sector bank offering financial services to customer segments, spanning large and mid-corporates, SME, and retail businesses. Its segments include corporate banking, retail banking, Treasury and Other Banking Business. Axis Bank Ltd is a full-service bank operating mostly in India, but with some international exposure. The bank operates and reports earnings under two segments: corporate and retail banking. Corporate banking solutions include credit, transaction banking, treasury, syndication, and investment banking and trustee services. Retail banking solutions include savings accounts, debit and credit cards, ATMs and mobile banking, personal loans and mortgages, life and general insurance, mutual funds and structured investments, and brokerage services. A plurality of the bank’s loan and advances comes from its corporate customers, while a plurality of its fee income comes from its retail customers. 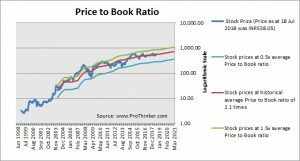 At the price of INR538.05 as at 18 Jul 2018, Axis Bank Ltd is trading at a Price to Book Ratio of 2.0 times current book value. This is a 4% discount to its historical average Price to Book Ratio of 2.1 times.